Have you ever wondered why you can hear someone who is round the corner of a building, long before you see them? It appears that sound can travel round corners and light cannot. What is the reason for this? Do light and sound share any properties that might cause this effect? Waves can spread in a rather unusual way when they reach the edge of an object – this is called diffraction. 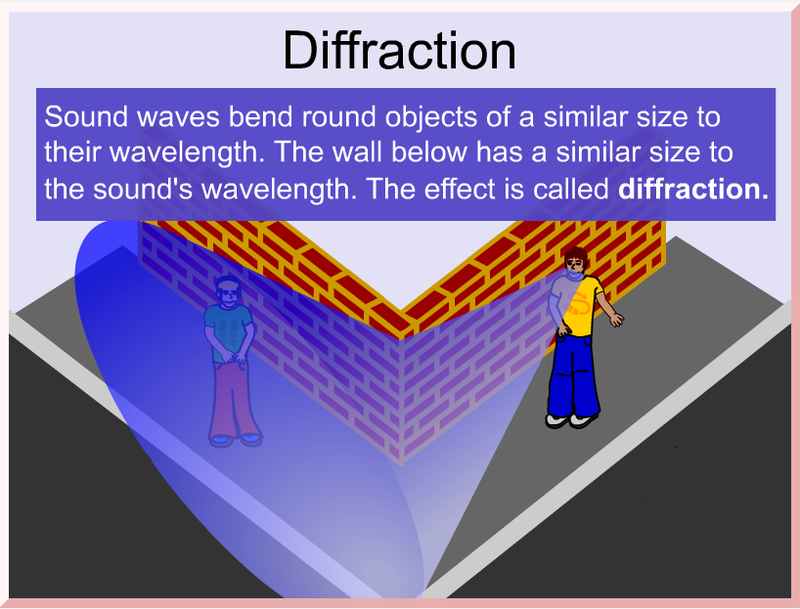 The amount of diffraction (spreading or bending of the wave) depends on the wavelength and the size of the object. Diffraction can be clearly demonstrated using water waves in a ripple tank. Have a look at this a simulation of three ripple tanks, each containing an object of different width, which obstructs the propagation of a wave. The key to understanding diffraction is understanding how the relative size of the object and the wavelength affect what goes on. Ripple tanks with large, medium and small objects (left to right) obstructing a wave. The obstacle in the right animation has the same width as the wavelength of the sound. By examining the three animations, decide which of these statements is correct in the following quiz. #1 Which of these is true? When the wavelength is bigger than an obstacle, then the sound waves mostly bend around the obstacle. When the wavelength is smaller than an obstacle, then the sound waves mostly bend around the obstacle. Behind a barrier, the sound which has a shortest wavelength compared to the size of the obstacle will sound quietest. Behind a barrier, the sound which has a longest wavelength compared to the size of the obstacle will be loudest. Behind a barrier, the sound which has a shortest wavelength compared to the size of the obstacle will sound loudest. Our simulation shows that with a ‘long’ barrier, there’s a lot of reflection of incident energy back towards the source, but although there is some diffraction or bending of the wave around the barrier, this still leaves a zone of silence behind it. 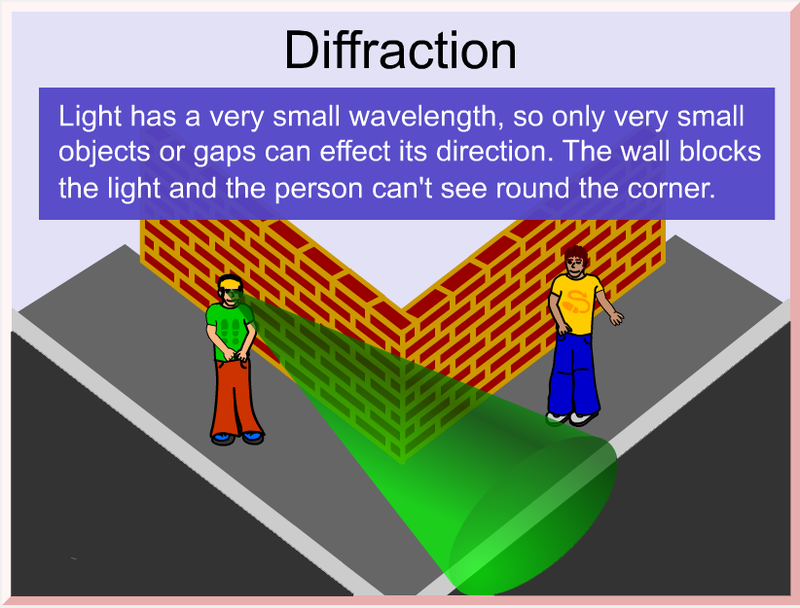 However with a short barrier (the same length as the wavelength) diffraction is very effective and there is almost no zone of silence behind it. From this, we can reach the conclusion that with sound waves, it is the low frequencies (which have long wavelengths) which diffract around corners. You can experiment with this by listening to traffic noise from a busy road from around the corner of a building (not in a direct line-of-sight to the traffic), and then moving to a location a similar distance from the road but in direct view of the passing cars. The swish of the tyre and wind-noise contains a lot of high frequency energy, and you should find that this does not diffract around the corner as effectively as the rumble of engine.